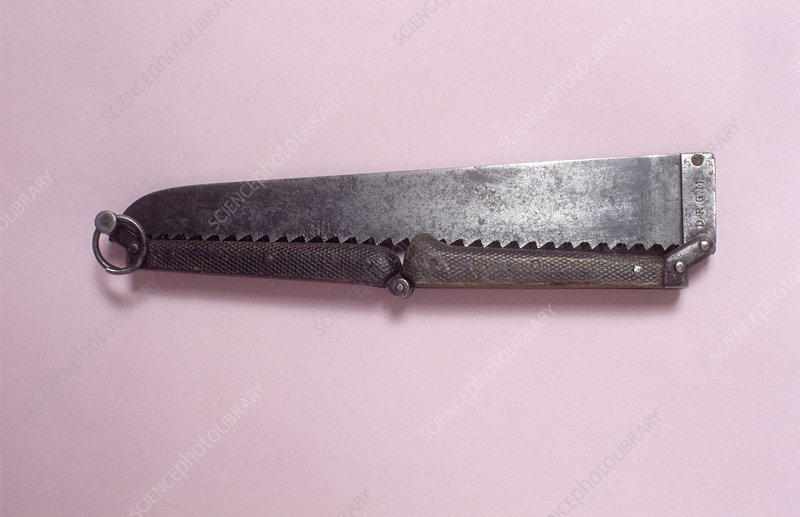 Limb saw with folding ebony handle (in the folded position), dating from around 1860, England. Instruments such as this one were used in limb amputation procedures where diseased or injured limbs would be surgically removed. An incision would first be made to the soft tissues with a knife to expose the bone. The limb saw would then be used to cut the bone as quickly as possible. A tourniquet would be used to minimise blood loss. Once the limb has been severed, the artery and then the veins would be tied off. The tourniquet would be loosened, and finally the flesh would be stitched up over the stump.